Melt the butter. Add zest & juice of lemon and 1tsp of thyme leaves to butter mixture. Set aside. Take giblets out of turkey & wash turkey inside and out. Place turkey in large roasting pan. Liberally salt & pepper the inside of turkey. Stuff the cavity with the bunch of thyme, halved lemon, onion, and garlic. Brush outside of turkey with butter mixture & sprinkle with salt and pepper. Roast turkey about 2 1/2 hours. 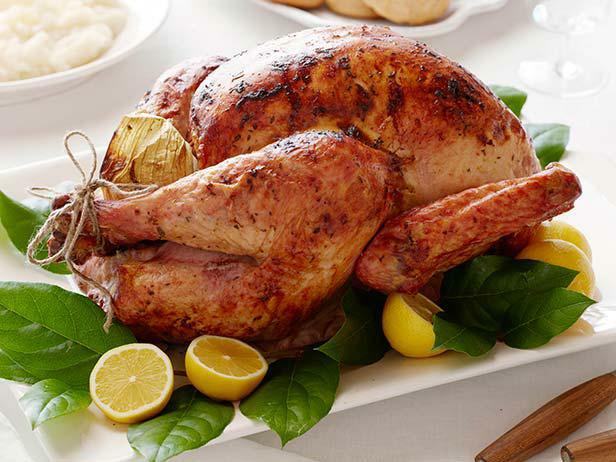 Remove turkey to cutting board and cover with aluminum foil; let rest for 20 mins then serve. Coat a large saute pan with olive oil, add onions and celery and saute over medium heat. Season with salt and cook until the vegetables start to become soft. Add sausage and cook until the sausage begins to brown. Stir in garlic and saute for 1 to 2 minutes. Add walnuts, sage and rosemary then cook for another minute, remove from heat. 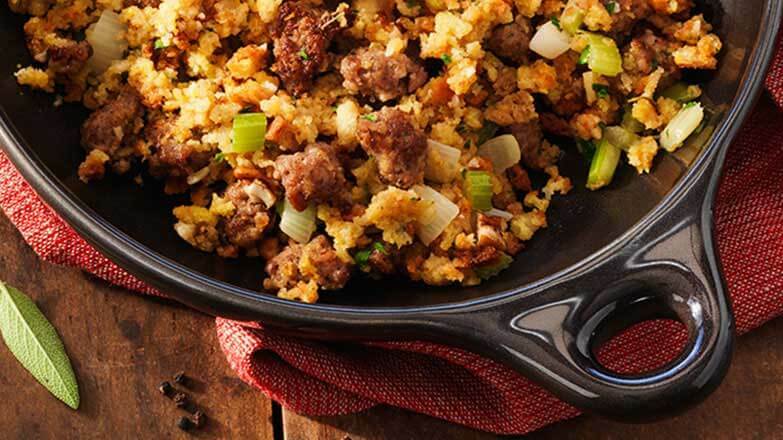 In large bowl mix together cornbread, cranberries, and sausage mixture. Add chicken stock and mix until bread is very moist. Bake stuffing until it is hot all the way through and crusty on top, about 30 to 35 minutes, then enjoy! For the filling: Preheat oven to 350 degrees F and butter the 2-quart baking dish. Whisk together butter, mashed sweet potatoes, milk, brown sugar, vanilla, salt, and eggs in large bowl. Transfer to baking dish. For topping: Combine flour, brown sugar, butter and salt in a medium bowl until moist and mixture clumps together. 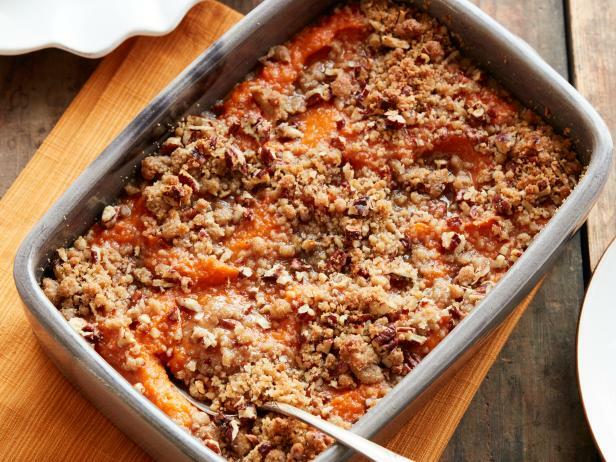 Stir in pecans and spread over top of the sweet potatoes in an even layer. Bake until mostly set in center and golden on top. 25 to 30 mins. Serve hot. Empty 12-ounce bag of cranberries into saucepan and transfer 1/2 cup into small bowl. Add 1 cup sugar, 1 strip of orange or lemon zest and 2 tablespoons water into pan and cook over low heat, stirring occasionally until sugar dissolves and cranberries are soft, about 10 minutes. Increase heat to medium and cook until cranberries burst, about 12 minutes. 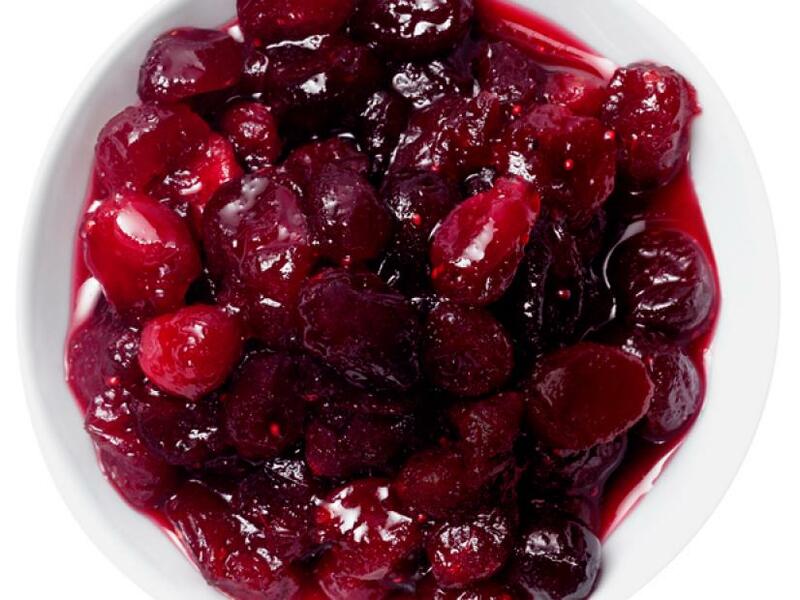 Reduce heat to low and stir reserved cranberries. Add sugar, salt and pepper to taste and cool to room temperature before serving.